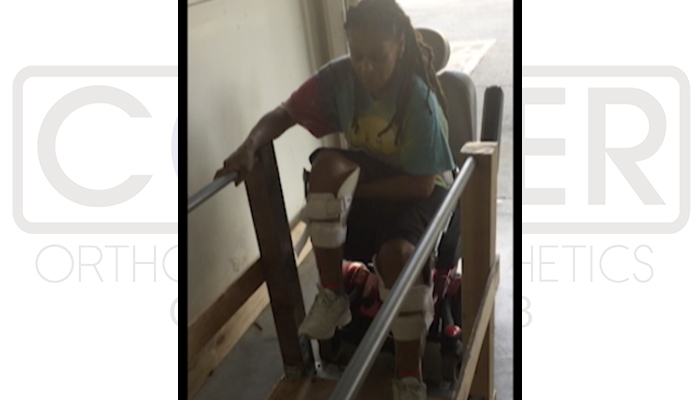 A determined Sandra gets a reciprocating gait orthosis, and gets out of her wheelchair! From her first meeting with Practitioner Brian Lee, Sandra Thomas was eager to be able to reach a new activity level. After being in a wheelchair for almost 5 years, Sandra wants to walk without any assistive devices or orthoses. Sandra’s biggest challenge has been to overcome her unstable gait due to a spinal cord injury. She has been working with Brian Lee for the last 6 months to learn and adapt to her new device. 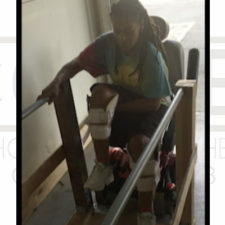 Collier Solution: By applying the reciprocating gait orthosis, Brian was able to give Sandra the stability to stand and transfer the strength and momentum of her upper body to her legs. She can now ambulate and feels the sensation of lower extremity muscle contraction. 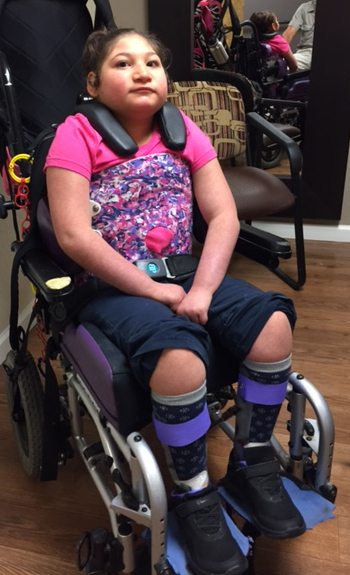 She is very hopeful to continue to progress toward independent ambulation. As you can see by the video, Sandra Thomas is determined and knows it will not be easy – our reward is to see how excited and grateful she is to receive this device that will help her toward her goal. 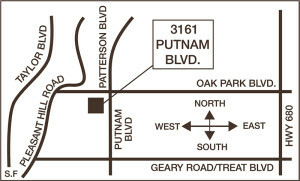 Are you interested in learning more about RGO development? Ask a Collier Practitioner below, or call us for a consultation. Sophia’s mother was concerned that Sophia always slouched severely and seemed to be in pain. She also always looked down, and could not make eye contact with those around her. 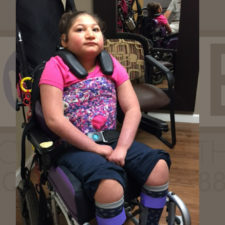 Practitioner Brian Lee cast Sophia sitting upright to maintain lumbar and kyphotic curves in the ideal position, and with appropriate scapular adduction and shoulder retraction. Secondarily, the goal was to maintain her cervical spine in extension. Over the last 6 months, Mom has reported that Sophia seems happier, and is able to look up and see the world around her and, most importantly, make eye contact. Collier Practitioner Brian Lee, CPO is CCS Paneled and bilingual in Spanish. You can read his bio here. 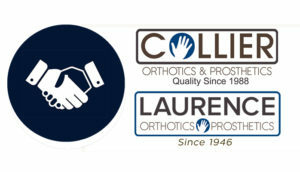 Mr. Cutchlow came to see Collier Practitioner Ray Diaz for a pair of new braces, and expressed frustration with his instability due to his Amyotrophic Lateral Sclerosis. Upon evaluation, Ray noticed the patient had more than just weak inverters/evertors. He also had no plantar flexion and dorsiflexion strength. Prior to the Phat braces he was using a walking aide, now he’s not. As you can see in the video, his gait is much more stable and his speed improved. The previous AFOs (Arizona braces) were not picking up his foot, causing him to buckle and fall when ambulating. Ray introduced the Phat braces to Mr. Cutchlow. These braces will provide the stance control and swing phase, and resolve the weak medial lateral ankle instability. The Arizona braces provided nothing for the absent plantar and dorsiflexion. The day Mr. Cutchlow came back for delivery of his Phat braces he couldn’t believe the balance, stability, and confidence the braces were giving him. Mr. Cutchlow has had two follow up visits. The first visit was to see how the braces are working for him. The second visit was a minor adjustment. It feels very rewarding to know Mr. Cutchlow’s goals were achieved and that it also built up his confidence to do more enjoyable things with his grandkids.